It’s nice to see Bono and James Cameron beginning to receive a little media attention exposing their hypocrisy. Both of these two have meddled in Canadian politics to push their agendas. 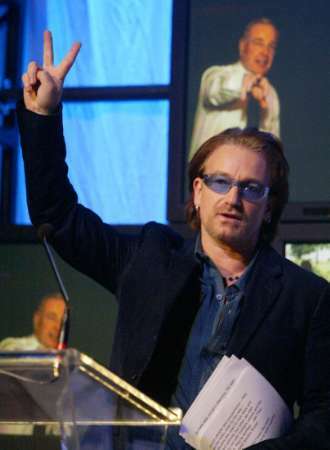 The Telegraph has run a column highlighting Bono’s charity One as a poverty organization that spends all its money on wages and expensive gift promotions given to the media. It also reminds the readers of Bono pulling his money out of Ireland for tax saving reasons. Then there is by far the biggest eco-celeb-nut hypocrite James Cameron who is currently campaigning to stop Alberta’s oil sands. Ezra Levant does a good job of shoving the words back down this carbon abusing clown’s throat. Levant – when he says “we” should live with less, he means “you” should. Cameron’s press tour to promote Avatar took him to 107 cities. Perhaps he’ll “live with less” for Avatar II, by flying to just 100 cities.